PennsylvAsia: 1979 Hayao Miyazaki film Lupin III: The Castle of Cagliostro (ルパン三世 カリオストロの城) in Pittsburgh area, September 14 and 19. 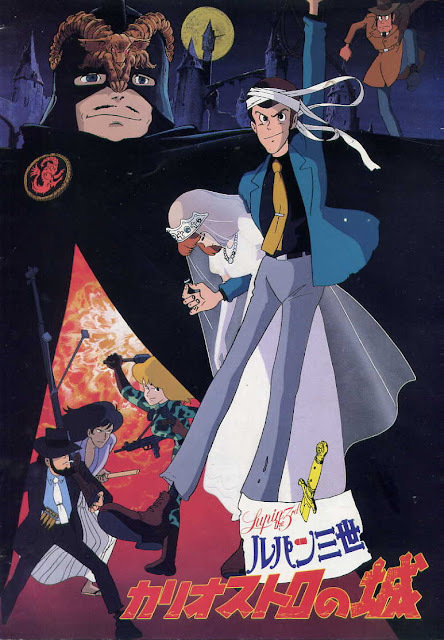 1979 Hayao Miyazaki film Lupin III: The Castle of Cagliostro (ルパン三世 カリオストロの城) in Pittsburgh area, September 14 and 19. Hayao Miyazaki’s directorial debut film, LUPIN THE 3RD: THE CASTLE OF CAGLIOSTRO is coming to U.S. cinemas nationwide for the first time ever this September for a special two-day event. Lupin and Jigen successfully rob a casino of millions, but only to find that the money is counterfeit. Lupin notices how well the money is forged and decides to make his next target the possible source of the forgery, Cagliostro. They enter the country and run into a car chase between a group of men after a girl in a wedding dress. Lupin, who loves girls, decides to abruptly make a detour to assist the bride in her escape. They successfully outrun the men but have an accident. Lupin goes unconscious but wakes up to find a ring with the royal crest of Cagliostro in a white glove from the bride. This exciting two-night event also features never before seen special footage with creator comments. The movie is set to play at the Cinemark theaters in Monaca, Monroeville, North Hills, and Pittsburgh Mills. Tickets for the September 14 English-dubbed shows are available online, as are tickets for the September 19 English-subtitled screenings (to find times and tickets be sure to enter the theater's location or zip code in the top-right corner).